San Francisco: Chronicle Books, 1994. First English Language Edition Paperback Fine in Very Good + DJ 8vo (7 x 7), 189 pp. Softcover book is FINE -- unmarked and appears unread in VERY GOOD+ French flap DJ cover, slightly shelfworn with barely visible scratch on front cover. (h) Major Italian fashion designer Samuel Mazza sent out a request to artists and designers to create brassieres that violate Walter Gropius' Bauhaus dogma that form follows function. Fanciful creations amuse and disturb. British Paintings 1500-1850 Sotheby's, London March 11, 1987: JASMINE. London: Sotheby Parke Bernet, 1987. First Edition, First Printing Glossy Pictorial Wraps AS NEW in WRAPS 4to (8-1/4 x 10-3/4). 156 Items presented in exceptionally fine reproductions on coated stock, most in full color. Book is FINE -- Unread, Unmarked, and AS NEW in nearly FINE wraps (slight bumping on corners, otherwise AS NEW.) (h) More than 100 artists represented, among them Sir Joshua Reynolds, Thomas Gainsborough, and Jacob Huysmans, as well as a full page reproduction of Benjamin West's historically important portrait of Sir Joseph Banks. In all, a brilliant assortment of maritime paintings, portraits, landscapes, and portraits of horses. Includes projected sale prices. Henry Moore: A Shelter Sketchbook (The First Volume). By Moore, Henry; Commentary by Frances Carey. London: British Museum Publications Ltd. / Prestel-Verlag, 1988. First Edition Hardcover Horizontal 8vo (8 x 7-1/4), 90 pp on archival card stock with 22 pages of text and 68 drawings all printed on only one side of the page. The copy is FINE -- Unmarked, Unread and AS NEW in AS NEW glossy pictorial unclipped DJ. (h) During WWII, Mr. Moore, already a major recognized sculptor and "Official War Artist" for England, was unable to work at his Hampstead studio which had been damaged in a bombing. He explained the reason for these drawings: "The official shelters were insufficient. People had taken to rolling their blankets out about eight or nine o'clock in the evening, going down into the Tube stations and settling on the platforms ... It was like a huge city in the bowels of the earth. When I first saw it quite by accident - I had gone into one of them during an air raid - I saw hundreds of Henry Moore Reclining Figures." He did some 82 sketches of which these 68 were the first volume to be published. view of war on an intimately personal level rarely, if ever, shown in any other wartime work. Ships from California. Avalanche Number 7 Winter/Spring 1973. New York: Winter/Spring 1973. First Edition, First Printing Glossy Pictorial Wraps Near Fine in Wraps Square 8vo (9-1/4 x 9-1/4); Unpaginated (approx 48 pp). Historically important journal at the peak of its excellence is NEAR FINE. B&W pictorial wraps are VG to VG-Plus with some tanning on stapled spine, pale tan mark and indentation on back cover, very slightly bumped corners, several short vertical almost invisible lines of scoring on front cover. Otherwise No marks, no rips, no tears. (h) Sharp and Bear foresaw the rise and impending influence of the SoHo artists, and did no reviews, but focused on them with interviews, news, and art process observations. Interviews with William Wegman, Ed Ruscha, Lowell Darling, General Idea Toronto, and Van Schley (center stiff cardboard double page with pocket has original postcards and page proofs of signs by artist plus Avalanche Order Form and announcement of Avalanche Video. (One page proof which had been placed vertically but is 1/4" taller than magazine itself was bent at top where it extended above, but not torn). Front section (Rumbles) has announcements or essays on current artwork, including Chris Burden, and video artists Juan Downey, Frank Gillette, and an obituary for Gerry Schum. The ads alone for shows and/or galleries are historically wonderful -- ads for Ruscha, Wegman, Joan Jonas, Texans Jack Mims, Jim Roche, George Green and Robert Wade; Joseph Beuys, Frank Gillette. Excellent historical document from this turning moment of American art. Quite rare. 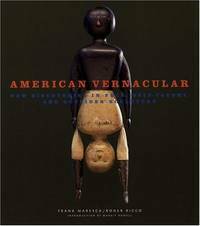 American Vernacular: New Discoveries in Folk, Self-Taught, and Outsider Sculpture. By Frank Maresca; Roger Ricco, Margit Rowell; Joseph Jacobs; Lyle Rexer. 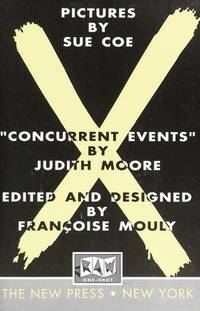 X: Pictures by Sue Coe, Concurrent Events by Judith Moore. By Coe, Sue, Moore, Judith, Edited/Designed by Francoise Mouly. New York: New Press, 1992. First Edition Thus, First Printing Pictorial Cover Fine. No DJ, as Issued 8vo (6 x 9-1/4) Hardbound book is FINE, Inmarked and Unread. No DJ as issued. Pictorial cover. (h) An homage to Malcolm X ("For Malcolm X and all those who have been Xed out of the American dream...") with phantasmagorical pictures from the hell Ms Coe sees American society to be. Opens with the Malcolm X quote: "We must make them see that we are the enemy ... So let them turn the money for defense in our direction and either destroy us or cure the conditions that brought our people to this point." Photos by Adam Reich and James Dee. The people who bemoan the "loss of creative anger" in current society haven't seen Ms Coe's work. Brilliant and frightening. Maler der Brucke: Farbige Kartengrusse an Rosa Schapire (Insel-Bucherei Nr. 678). Frankfurt: Insel - Verlag, 1958. First Edition Pictorial Cardboard Covers Fine in Near Fine Pictorial Covers 12mo (5-3/4 x 7-1/4), Unpaginated. Book is FINE with barely visdible wear on spine edges, and 1/2" x 1/4" piece of glued tan paper on gutter bottom of front flyleaf. (h) 19 color illustrations of work by Erich Heckel, Ernst Ludwig Kirchner, Max Pechstein, and Karl Schmidt - Rotluff. Text is in German. 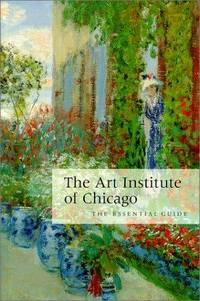 The Art Institute of Chicago: The Essential Guide. By Edelstein, T. J; Sally Ruth May, James N. Wood. Chicago: Art Inst of Chicago, 1993 - 1997. Pictorial Wraps AS NEW in WRAPS 8vo (6 x 9), 288 pp including Index, 250+ color illustrations, coated stock. Paperbound book s FINE -- Unmarked, Unread, AS NEW in AS NEW Pictorial wraps. (h) An extraordinary representation of an extraordinary collection representing a comprehensive history of some of the most brilliant and moving moments of art and architecture from 1000+ BC on, divided into sections of presentation: "Africa, Oceania, and the Americas," "American Arts," "Architecture," "Asian Art," European Decorative Arts and Sculpture and Calssical Art," "European Painting," Photography," Prints and Drawings," Textiels," and Twentieth-Century Painting and Sculpture." Ranging from Hokusai's "The Great Wave off Kanagawa," to Edward Hopper's "Night Hawks at the Diner." Excellent color printing on coated stock. Antoni Tapies: O L'escarnidor de didemes (Or The Scoffer at Diadems) -- in English, Spanish, French, and German. By Vicens, Francesc (text) Brossa, Joan (Oracular poetry). Barcelona / New York: Ediciones Poligrafa S.A./ George Wittenborn, Inc., 1967. First Edition, First Printing Cloth AS NEW in FINE DJ Square 8vo (8-1/4 x 8-1/4), 200+ pp with 81 pages of text and 128 full-page photographs (by Joaquim Gomis), most in color plus fold-out indices of illustraions allowing an extra page on the right for reference while looking at the art works. Hardbound in white cloth with red figuring by Tapies, FINE/As New in FINE glossy pictorial DJ which is overlaid with heavy plastic bearing the title on front and spine (minor bumping on top corner). pp.,128 colour and b/w plates. Indices. Poem dedicated to Tapies by Joan Brossa. Essay by Francesc Vicens. Photos by Joaquim Gomes. Four language edition, English, Spanish, German and French. Illustrated dustjacket with protective mylar sleeve. White cloth covered boards with red titles and decoration by Tapies. Art As Technology: The Arts of Africa, Oceania, Native America, and Southern California. By Rubin, Arnold and Zena Pearlstone. TATTOOTIME: V 1, 2, 3 -- TRUE FIRST EDITIONS (V1 NEW TRIBALISM - 1982; V2 TATTOO MAGIC - 1983; V3 MUSIC & SEA TATTOOS - 1985) AS NEW. Forked River, NJ: Permanent Press, 1982, 1983, 1985. FIRST EDITIONS, FIRST PRINTINGS Glossy Pictorial Wraps AS NEW in WRAPS Softbound 4to periodicals (8-1/2 x 11) Volume 1, Number 1: 64 pp; Volume 2, Number 1: 64 pp; Volume 3, Number 1: 96 pp including Memorial for Greg Irons. These three volumes are AS NEW, have been kept out of the sun and in plastic sleeves -- they are as crisp ond bright as they were 20- 25 years ago. Incredible reproduction, photographs of historically significant tattoos along with some of the most extraordinary and important masterpieces of the late 20th century. These are the true first editions. Incredible reproduction, color photographs of some of the most important tattoos of the late 20th century. Tattootime was one of the publications that showed the world there was an art in the tattoo. I'm certain the later editions show the same glories, but these are the ones that the true collectors want.